» Why ban weddings on farms? Why ban weddings on farms? Nice place for a wedding: the Smalleys’ Whisper-n-Oaks as shown on their website. A pending appeal in Benton County illustrates the byzantine and repressive nature of Oregon land-use laws where farms are concerned. Why does the law care whether farmers, when they’re not out there sowing or reaping, rent their yards out to someone who wants to get hitched? Robert and Donna Smalley, owners of a 70-acre farm on the Benton-Lane county line, were holding weddings at their place and advertised online as “Whisper-n-Oaks,” which generated a complaint to the county zoning authorities. Through their lawyer, Michael Farthing of Eugene, the owners cited a section of the state and county zoning laws that allows “onsite filming” for up to 45 days a year on land in the exclusive farm use zone. Their point is that no doubt someone routinely video-records the festivities at their place, and this qualifies the events as “filming” and makes them therefore OK. The county planning department and the planning commission refused to go along, and their denial is being appealed to the board of county commissioners, which scheduled a hearing in Corvallis for Dec. 2. On the face of it, county officials have a point. The filming exception was clearly written into the exclusive farm use law to allow film and video productions that want rural or farm scenery. And weddings probably are not held mainly for the thrill of making a video. On the other hand, who’s to say what amounts to a legitimate form of “filming” under the law? The law does not distinguish between “filming” a milk commercial, a murder mystery or a documentary of a wedding. All are allowed. With that in mind, you’d think farm owners could rent their place out for weddings and parties if they advertised it as a “perfect backdrop for a video of your special event.” They could include a 20-minute professional video as part of their rental package to drive home the point. The basic question, of course, is why Oregon’s land-use laws keep farmers from supplementing their uncertain annual earnings by renting their barns or yards out for events like parties and weddings. Or why they discriminate against people on the grounds of religion. They could plant an acre of grapes and make a few bottles of wine every year, serve the wine as part of the wedding ceremony and call themselves a vineyard. The problem with all of the land use exceptions is that they generally cost money to put in place and make the whole exercise prohibitive. 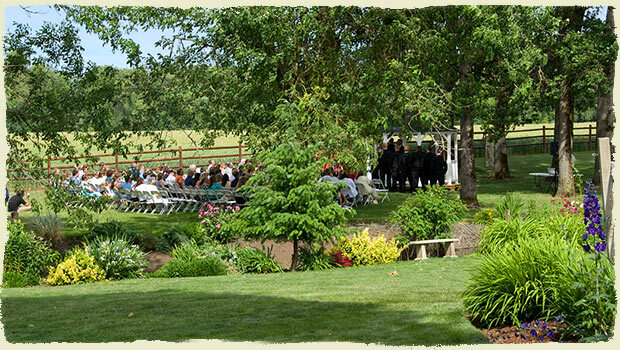 Weddings in rural areas have been going on a long time in Oregon and they will continue to happen in the future. What the current land use law prohibiting them does is block any kind of reasonable conversation about adequate facilities for such events with local government whose real interest should be the safety of the hosts, their neighbors as well as the attendees. Out here in the Scio area these sort of issues have arisen in the past. I feel a little too close to it to comment directly. But I think elements may be tax laws and preservation of the family farm and keeping speculators from sprawling. When I was younger I drove by Kent valley near seattle. Wide lush green valley and rich rich soil. Now it is covered with commercial buildings. Lots of money and jobs being generated. Not much food. Why is the soil so good? Right next to a really big volcano. It blows up about once an ice age and cover everything in meters of ash. I wonder how that will work for them. But let me introduce you to a meme: you are treating byzantine as a perjogative. My Mother is Orthodox, you insensitive clod! At what point do “small gatherings” become “large parties”? I can understand non farm uses being “nipped in the bud”. Otherwise you’ll always having people trying to push/expand the limit. IF it’s a “family” wedding, go for it. You’ll run out of children soon enough. Not sure because I don’t know the specifics, but when a complaint has been filed then the county has to act, and it’s often because a neighbor is ticked off. Maybe traffic/parking issues when a whole bunch of cars shows up? Some more info on the why seems in order.